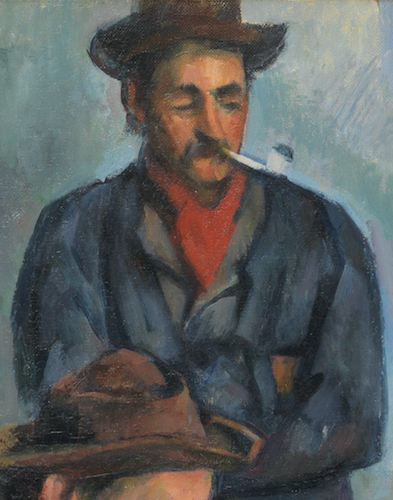 Writing near the end of his life, Paul Cézanne told an art critic that “one does not put oneself in place of the past, one only adds a new link.”  In other words, through his art he wanted to engage with art history but also to modify it and take it in a new direction. It is a sentiment beautifully exemplified in the artist’s five paintings of card players, which he had worked on about a decade earlier, in the early-to-mid 1890s. In terms of its subject matter, the series owes a clear debt to earlier depictions of card and game players by Baroque and Rococo artists such as Caravaggio (above), de la Tour, the Le Nain brothers, and Chardin; within Cézanne’s own lifetime, the theme had been taken up anew by Daumier, Meissonier, Degas, and Caillebotte. Cézanne’s “new link” lies in the way he steers the subject away from its obvious symbolic and dramatic potential: clubs and hearts, winners and losers, the cheaters and the cheated. All of this had been thoroughly explored already. Instead, Cézanne attends to other aspects of the activity. He stresses the shared social space of the card game, intimate and familiar, and the attention and concentration the game demands. Not coincidentally, these are the same psychological states demanded by the acts of making and looking at art. 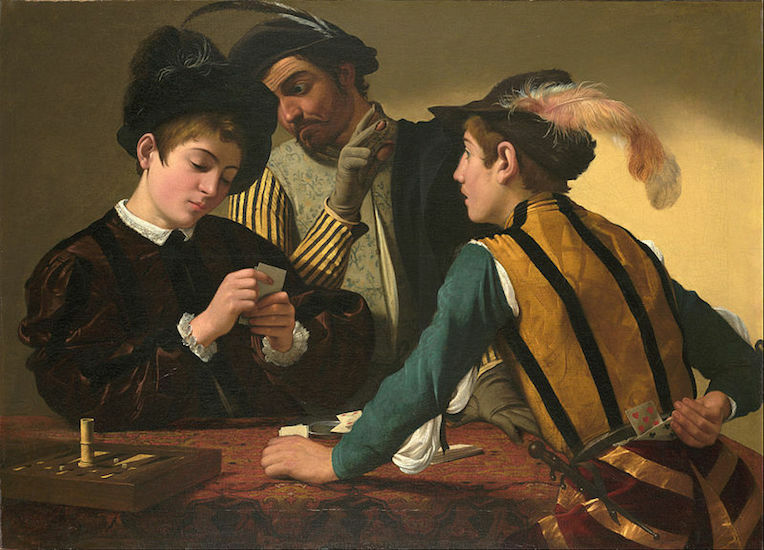 The version of the card players at Metropolitan Museum of Art (image at the top of the page) is now generally thought to be the earliest of the five paintings in the series. It depicts somewhat eccentrically-proportioned figures surrounding a table: three play cards and a fourth merely observes the game, his pipe indicative of his contemplative attitude. These are rural laborers quietly and sociably passing the time in a tavern or room. Like the other works in the series, the setting in the Met’s canvas is sparse. We see a table and three chairs (two of them more implied than fully described); a full pipe rack and a swag of yellow fabric hang from the room’s rear wall. The tabletop creates a clear focus of attention within the larger work. It supports the players’ arms and hands, which, in turn, provide a frame for some objects: a pipe, cards, and a prominent grey rectangle—perhaps a tobacco pouch or another card. And yet one detail in the Met’s painting points, albeit subtly, to a sequence of events and thus to the logic of an actual game. The figure on the left of the work (modelled by one Paulin Paulet) appears to be on the verge of extending his index finger (see detail below), as though about to pick up a card from the table. It’s a gesture that connects thought to action, the contemplation of a hand of cards to the movement of a hand. 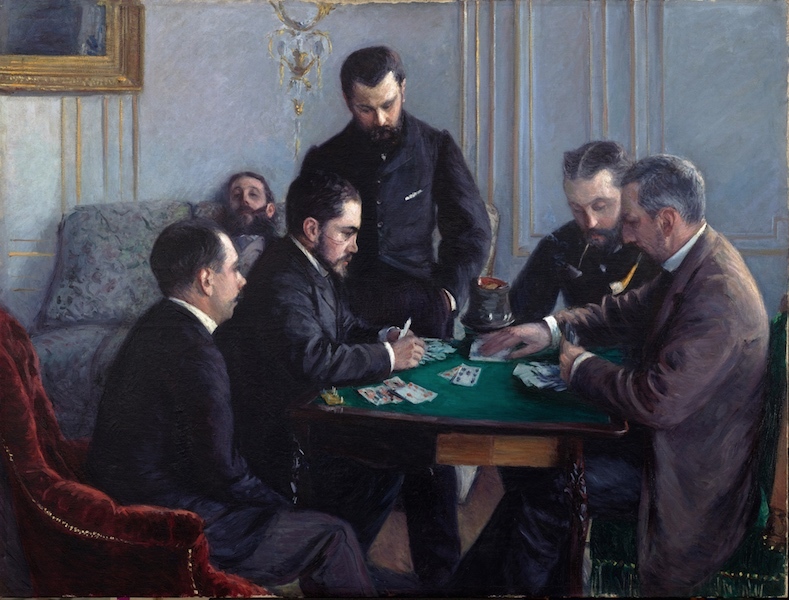 Similar actions, although more emphatically rendered, can be found in an earlier depiction of card players by Gustave Caillebotte (below), who was both Cézanne’s colleague in the impressionist group and a collector of his work. 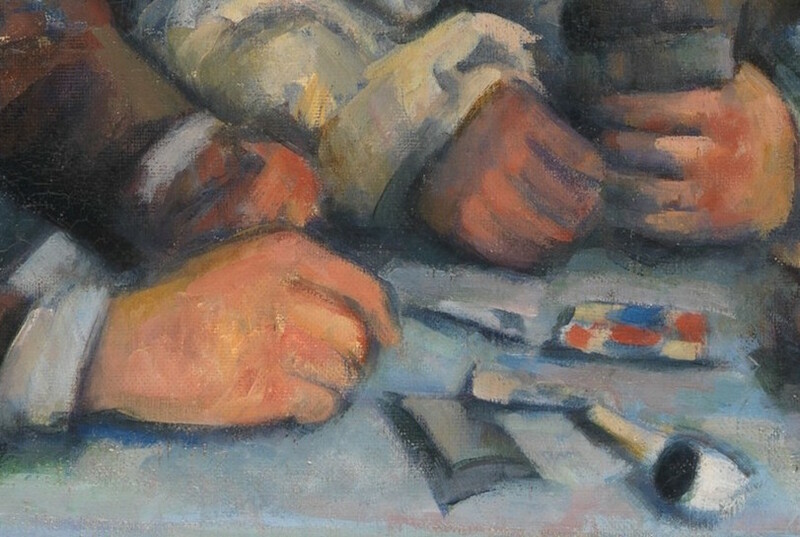 The particular logic of any card game determines the value of any given card within it, and so Caillebotte provides us an important clue in his title (The Bezique Game) and even allows his viewer to discern the colors and ranks of a few cards in his painting (a red ace, a black seven). In contrast, Cézanne’s instinct is to withhold all such information—to keep his cards close to his chest. On his table, there is an upturned card holding three roughly rectangular patches of red pigment (see detail below). But these patches do not closely resemble diamonds and, as though to lessen any resemblance, the card also contains similar patches of white and bluish paint. For Cézanne, the formal elements (color, shape, texture, composition) ultimately trumped narrative considerations. The marks we see on the card create a grid of compositional elements, and this places the card in relationship to two analogous grids. The first consists of the larger collection of objects on the table, where the objects and the spaces between them form a kind of tic-tac-toe pattern. The second is made up of the four figures themselves, each of whom occupies one of three distinct spatial zones (foreground, middle-ground, background) as well as one of three different lateral positions (left, center, right). 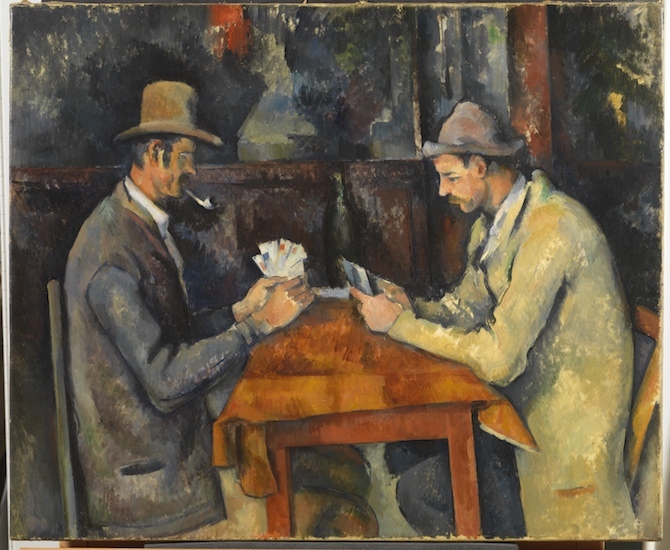 This connection between objects and figures is even more evident in the largest work in the series of card players now at the Barnes Collection in Philadelphia (see below), which Cézanne probably made soon after the Met’s painting. By adding a fifth figure at the back right, the figures now repeat the X schema formed by the objects on the table. The three remaining works in the series (Courtauld Gallery—see below, Musée d’Orsay, and a private collection) contain just two card players confronting each other in strict profile, a compositional idea that first appeared in the two foreground figures in the Met’s work. In these later paintings, the table is narrower and cleared of all objects, with the exception of a centrally placed wine bottle. The two men study their cards intently, but no movement or move appears imminent. The details of the game have receded still further and life has been stilled. 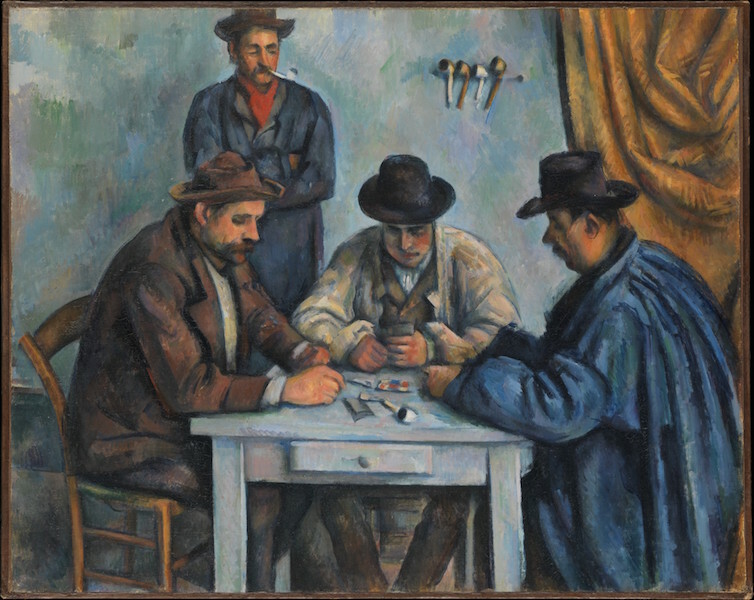 Cézanne’s card players, like many of his figures, occupy a space somewhere between the painting of figures and the painting of objects. They drift between different genres. A New Yorker cartoon exploits this drift to humorous effect. In it, Robert Mankoff lets still-life elements and game-playing details flood back into one of the artist’s two-figure works. He fills up the card players’ arms and table with piles of apples, reminding us of Cézanne’s close association with the fruit. “I see your Granny Smith,” runs the caption, “and I raise you a Golden Delicious” (view image here) Cézanne’s famous apples are now a specific type, as though straight from a supermarket. His figures are now not merely poker-faced: they are poker players. 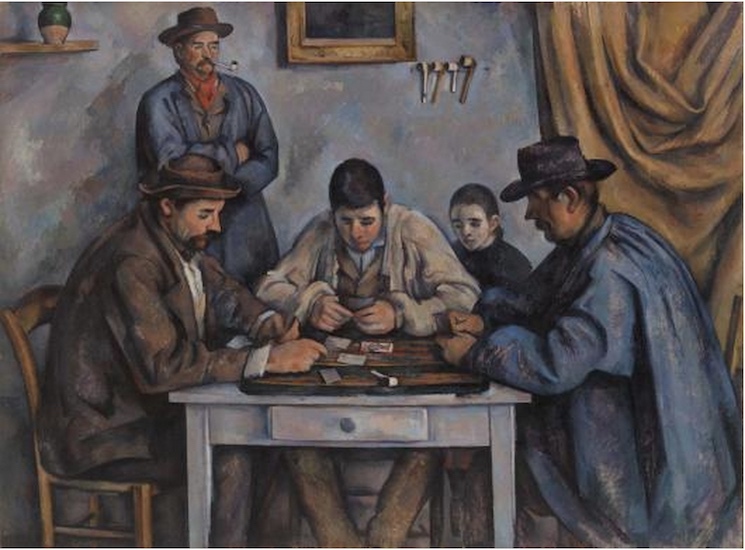 Though no money seems to be at stake in Cézanne’s card games, commerce was certainly involved in the creation of the piece. By the 1890s, Cézanne was independently wealthy; he could comfortably afford to pay his models to pose and the resulting works were made out of industrially produced pigments usually applied to commercially manufactured, standard-size canvases (a “no. 25” in the case of the Met’s work). Around the same time he finished the series, the artist struck up a relationship with a Parisian picture dealer, Ambroise Vollard, who then became the first owner of the Met’s canvas. Vollard’s business ledgers record that he made a tidy profit from the work, buying it for 250 francs and, in early 1900, selling it for 4,500. 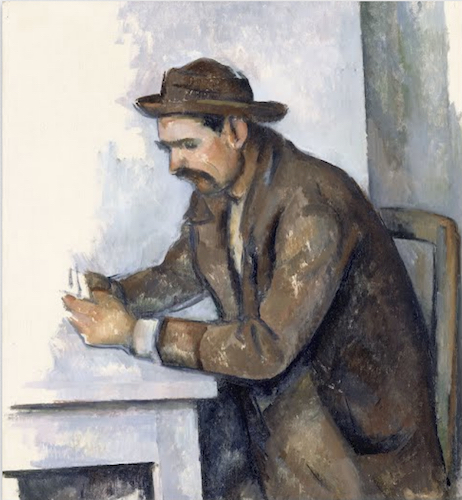 The enduring appeal of Cézanne’s card players, though, may owe something to the way the five paintings provide a distinct contrast to the modern capitalism that surrounded their creation. If life can seem increasingly fast, superficial, and mercenary, then perhaps some consolation can be found here—in our prolonged engagement with handmade canvases showing a timeless, rooted, and sociable pastime. Letter to Roger Marx, January 23, 1905, as quoted in John Reward (editor), Paul Cézanne, Letters(Da Capo Press, 1995), p. 313. Letter to Camille Pissarro, July 2, 1876, as quoted in John Reward (editor), Paul Cézanne, Letters(Da Capo Press, 1995), p.146. Cite this page as: Dr. Ben Harvey, "Paul Cézanne, The Card Players," in Smarthistory, November 20, 2015, accessed April 20, 2019, https://smarthistory.org/paul-cezanne-the-card-players/.